And so the day of my graduation has arrived, but unlike most of the students around me, my time has not been spent typing essays into my laptop or spending hours sweating over revision for my next exam. My tale is one less of academic achievement and more of sheer luck. Once a decent prospect at various non-league clubs in the Birmingham area, a recurrent knee injury put paid to my dreams of making it in football, on the field at least. After several years of working crap jobs for peanuts I was given the chance to get back into the sport. My wife, then girlfriend, had just moved to a small village in rural Leicestershire when I happened across an advert in the local newsletter which was distributed to every household in the parish; ‘Coach wanted for under 10’s, no experience necessary’ I had never really entertained the idea of coaching before but something in the back of my mind told me to go for it so I e-mailed Dave Wagstaff, the treasurer of Three Views FC to register my interest. Several weeks later I had almost forgotten about the job, assuming I had been unsuccessful when I received the call that set me on my current career path; ‘Hello mate it’s Dave Wagstaff from Three Views, I’ve just taken a look at your application you sent me for the job of under-10’s coach, after some consideration I'm happy to give you the job if you still want it?’ I later found out from Dave that I got the job by virtue of being the only applicant! I took to coaching like a duck to water as my kids stormed to the division title, I put that success down to my philosophy establishing a strong work ethic and not standing for show boating or ball hogging players who are adverse to passing who are all too common amongst the youth ranks, one or two kids with inflated egos trying to win every game on their own. My success at under-10 level was rewarded as club chairman Barry Gordy promoted me to the under-15’s, the highest youth rank that the club operated, again I found myself immediately successful, finishing as runners up in the Burton-upon-Trent district league as well as reaching the under-15’s county cup final against Leicester City, In the end we were comfortably outclassed by the Foxes 5-1, but reaching the final was a major achievement in itself which earned me the job of first team manager the following season. Silverware would again follow, however unlike my switch from under 10’s to under 15’s the transition to the senior team was not seamless, still just 24 years old myself I found it very difficult to get the respect of my small squad, almost all of whom were older than myself, some by almost twenty years Several individual’s chose to peruse their footballing interests elsewhere, those leaving were replaced by some of the under-15’s who had by now turned sixteen and thus become ineligible for that rank, causing me to have the youngest squad in the division. This inexperienced almost cost us dearly as we went into the final game of the season with relegation a real possibility, thankfully a win against The Cricketts Inn, a pub side from a neighbouring village kept us up but many of the older players who had chosen to stay made no secret of their opinion of me and my management after a disappointing season. I thought long and hard about quitting, however I chose to stick it out and was rewarded when we won the County Sunday cup at considerable odds and finished third in the division, It was then that I began to think seriously about football management as a proper career. Up until now I had only coached in my part time, meeting with my players once a week for training and taking charge of matches every Sunday, however now I could see I had a talent for coaching I decided to get some formal training to enable me to start treading a path in the professional game. I enrolled at nearby Loughborough university, a national sports academy which runs courses accredited by both the FA and UEFA. After two years of studies I was given my national C licence, an opportunity to coach another Sunday League outfit Loughborough & Shepshed casuals followed, whilst I made no waves with L&S my record did convince the University to offer me the job of head coach of their prestigious University team whilst I finished my studies. A team which has a long and decorated famous alumni roster, several of whom have gone on to become full international players. The club was founded in 1920 under the name Loughborough College. They joined Division Two of the Leicestershire Senior League in 1966, where they remained until 1972. The club then left Senior football, and did not return until 2007 when they were promoted to the Premier Division of the Midland Combination. In 2008–09 they won the league's Premier Division, and were promoted to the Midland Alliance. The Scholars ground shared at fellow local side Loughborough Dynamo until moving into the new Holywell Park, Loughborough University Stadium. 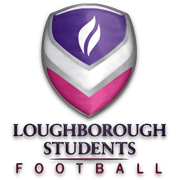 The squad as you might expect is made up of Loughborough students, strictly speaking there are no restrictions on players I can sign but in the interest of realism I will only be taking on players under 25 years of age. The club is amateur which means I cannot protect any of my players contracts and other sides can sign them without compensation, this will make building a squad difficult, however the idea of club is that our players graduate to bigger things so the challenge is not to think of seeing a player move on as a bad thing and instead something tat should be celebrated as we have done our job in preparing them. 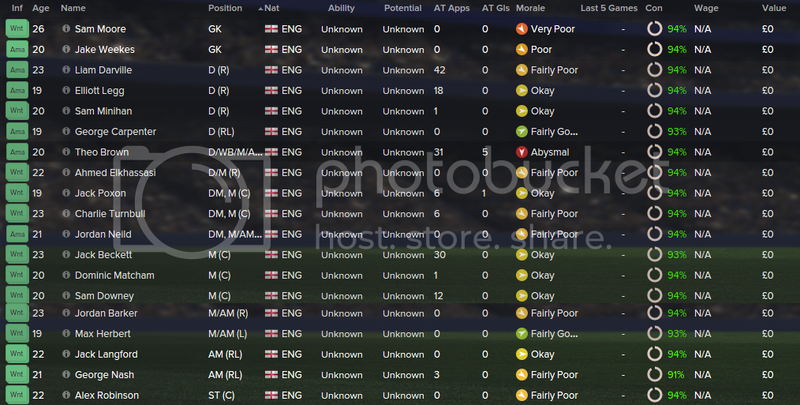 As you can see almost everyone in the squad is wanted by one club or another so I'm likely going to have to build an entirely new team which I'm quite looking forward to. We will be taking part in the Midland Football League which is a newly formed system at step nine of the league system, replacing the old Midland Alliance league. We will also be taking part in both the FA Cup and FA Vase. In terms of targets I just want to do as well as possible with the scholars for a couple of seasons before moving on, I have no illusions of taking an amateur team to the Champions League or anything like that.